Enjoy a relaxing session in one of our Far Infrared Saunas – get healthier and eliminate toxins at the same time! We offer 30 or 45 minute sessions at 60 degrees in single occupancy saunas. WHY FULL SPECTRUM INFRARED SAUNA? A Full Spectrum Infrared Sauna differs from traditional saunas as it uses infrared energy to directly penetrate up to 1.5 inches into the body’s tissue to produce sweating. Lower temperatures make the environment more tolerable, while also allowing you to breathe easier. A Full Spectrum Infrared Sauna offers Near, Mid and Far infrared waves. Each penetrating the skin at different wave lengths. Far Infrared penetrates deep into our body for a deep heating action which allows the body to activate the sweat glands. The sweat glands offer one of only a few mechanisms that the body has to eliminate toxins and since the skin is the largest organ in the human body it is a very good means for elimination. Mid Infrared focuses on improved circulation, the same as if you were doing a workout, pain relief and weight loss. Mid Infrared waves continue working even after the sauna session is completed. LED Near Infrared Rays have shorter rays that penetrate just the top surface of the skin improving cell health, skin rejuvenation and helping to heal any impurities. WHY ZERO EMF & NO ADDED CHEMICALS? All full spectrum and far infrared saunas also produce a Electric Magnetic Field (EMF) that is necessary to emit the infrared rays. The strength of the EMF varies is strongest between 0 – 1 inch from the centre of the heat panel. Our Tosi saunas are rated at a 0-0.6MG in this area whereas other infrared panels can go well past 10MG and even past 100MG. 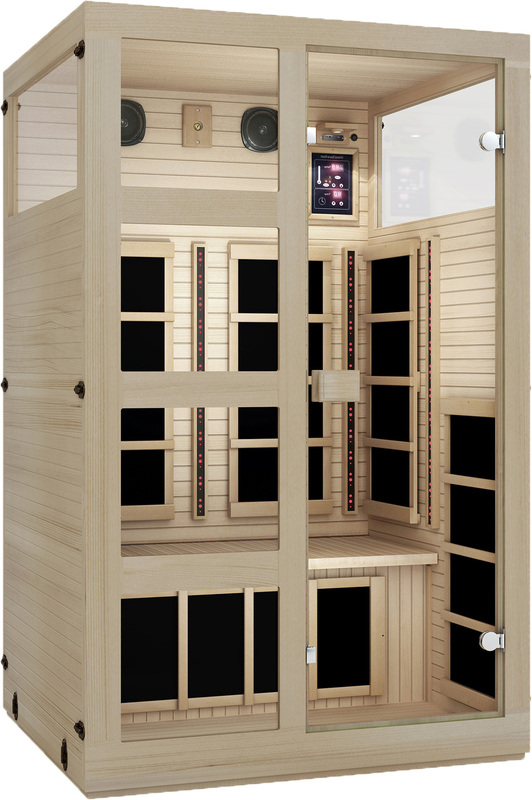 Tosi Infrared Saunas are made out of FSC Certified Canadian Hemlock Wood and is made with no added chemicals or plywood. You can relax easy at Cocoa. Visit our Yaletown and Gastown Studio pages for details about rates and packages! Far Infrared rays will penetrate the body up to 1 3/4 inches which will heat the core much deeper and more efficiently than a traditional sauna. Our infrared sauna is always pre-heated, so your time isn’t wasted warming up!